I'm not going to get into too much detail. The pictures speak for themselves on this one. Either you love when some one takes a tried and true design and turns it into a unique beast, or you hate it. There is rarely someone in the middle on these issues. This Rick Toone T2 is designed to be polarizing. The craftsmanship may speak for itself. 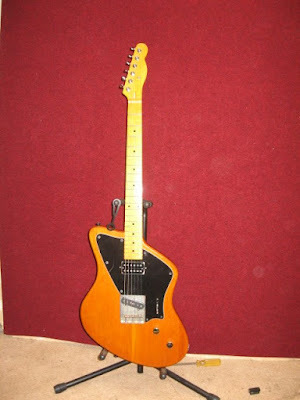 It looks extremely well made and has all the elements of a great guitar. What I'm mostly offended by is the price, $17500 US. Admittedly I know very little about the Luthier Rick Toone apart from the fact that I've heard his name before, and have seen one or two of his more ergonomic offerings. Has anyone here own/played one of his guitars? Is it worth the hefty price tag? © 2016, Guitarz - The Original Guitar Blog - the blog that goes all the way to 11! I spotted this today on the Facebook page for ugly guitars. The poster calls it the Mongrelcaster. There are no other pictures or information. It's my new favourite offset-tele syle guitar. Congrats on standing out without being too wacky or disgustingly odd. It's somewhat reminiscent of an Eastwood Senn model . Modern and classic. Does it remind you of another guitar?